Coolest Chevron Sewing Technique - Ever. I always love coming across new sewing tips and techniques that help me to think about creating and crafting in a new and inventive way. Not being from the quilting world myself, this particular chevron sewing technique quite frankly…blew my mind. Up until now, I have only ever seen it pieced together, until today. Hold onto your seats my friends, because you are about to fall off your chair. 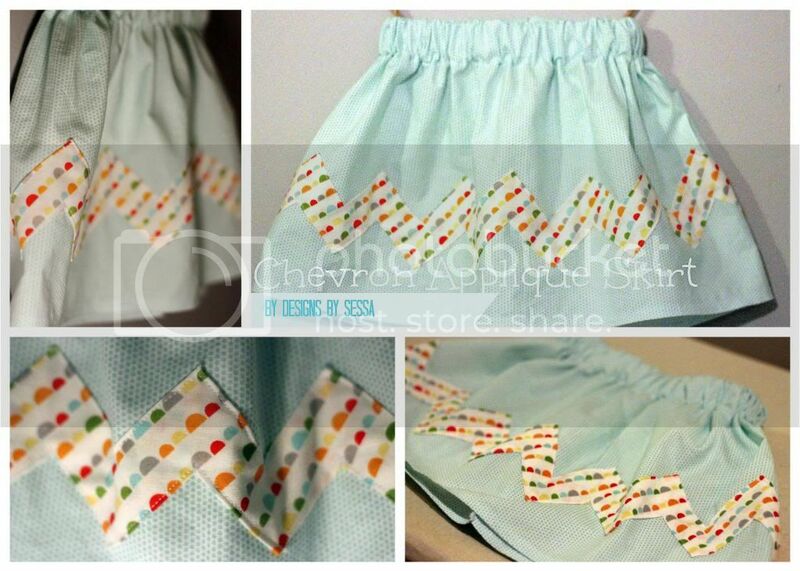 How to create and sew Chevron, the EASY way. This is truly the coolest technique I’ve ever done and I have a co-worker at my work to thank for showing me how it’s done! I’m not really a quilter and this sort of charts into that category in my mind. I also don’t sew much for little girls, but I just found out I am an approved Foster Mommy! I thought, I better practice some girl sewing, because we may get a call any day now for some children and I have to be ready boy or GIRL… which I am not so secretly hoping for! At least I have 1 hand-made item in my Foster Care closet, if we ever take care of a girl! Otherwise, it will sure make for a cute hand-made gift! With the chevron craze, the one thing I get frustrated over is finding just the RIGHT chevron fabrics. 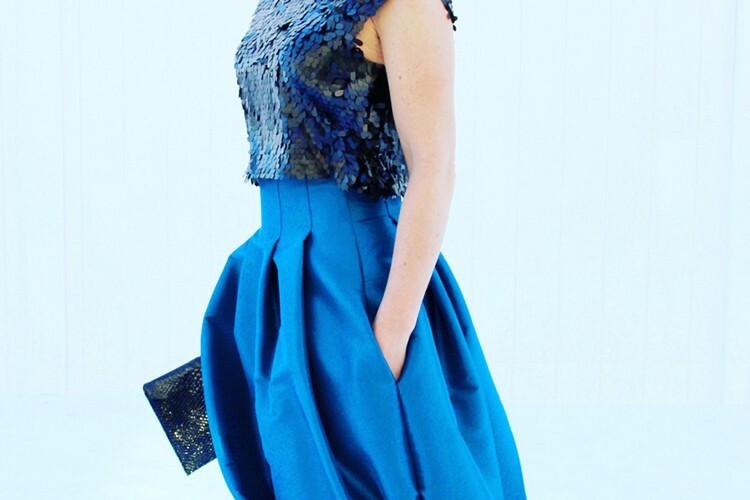 This tutorial will allow you to use whatever fabric combo you love together! You could use this technique on clothing, curtains, pillows, you name it! It just takes a little bit of time and ironing, but it’s quite simple! Marking pen. I love FriXion Iron Off Pens! 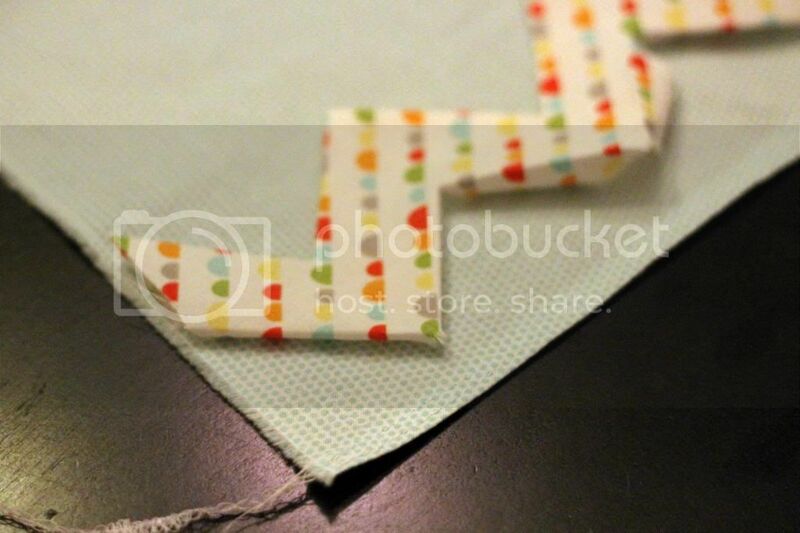 Cut out your template and lay your printable template out on your fabric. 1. Cut a 3” strip of fabric. 2. Cut your slits up towards the center across your template. 3. Mark each center slit with a line with your marking pen. 4. 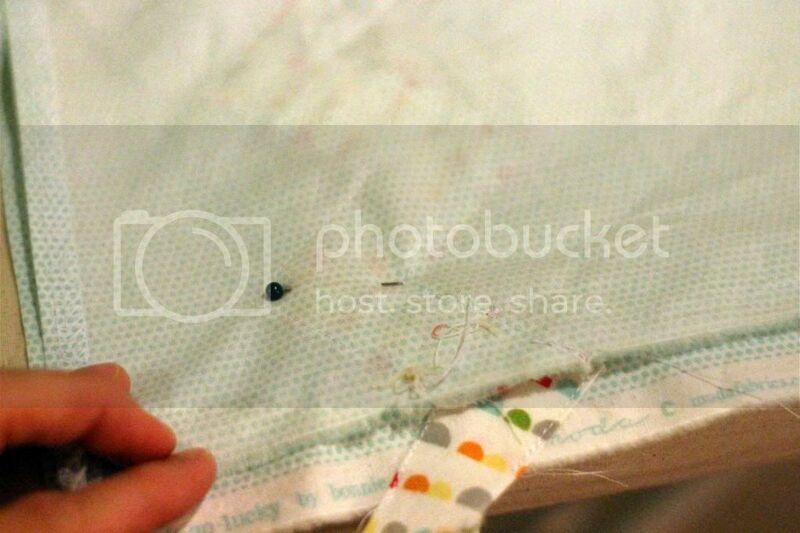 Mark all the way across the length of your 3” strip of fabric, moving your template down when necessary. 5. 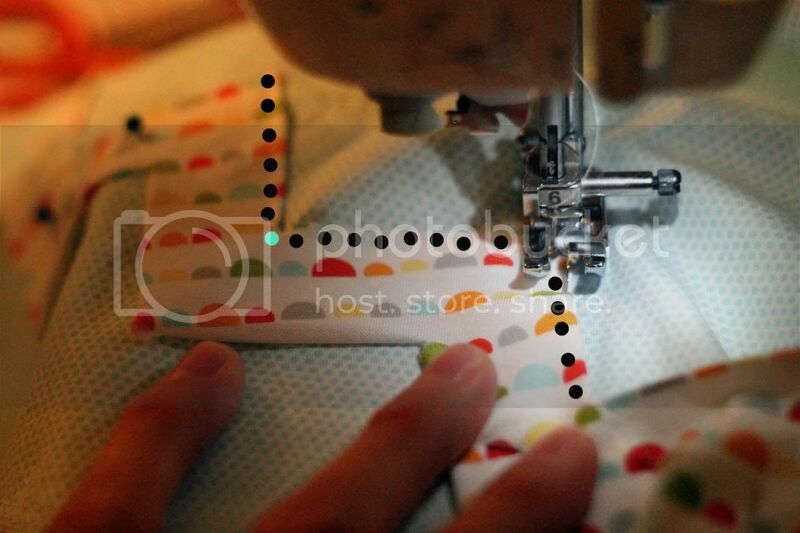 Using your rotary cutter and mat, cut open each marked line. 6. 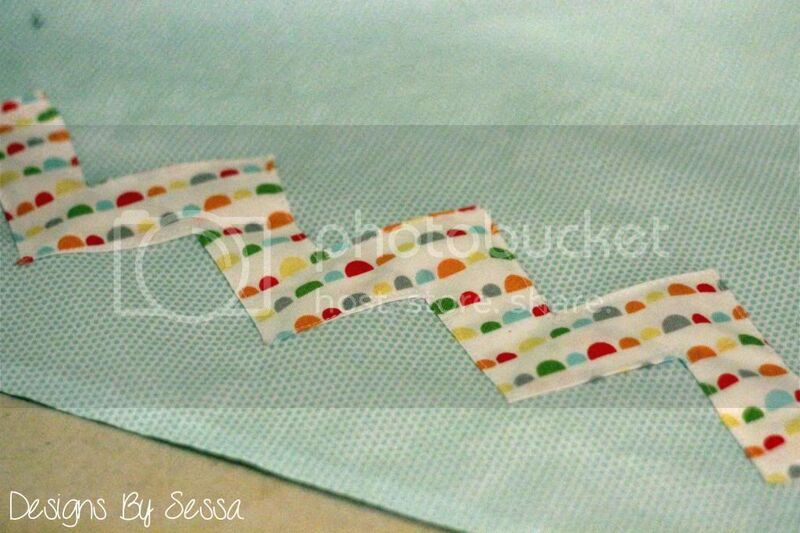 Cut down the length of your strip of fabric at each marked line both ways. Next, let’s create your chevron! 1. Fold each rectangular section in towards the center and iron down flat. 2. Fold the other side in towards your current triangle, making a triangular point. Iron down flat. 3. Repeat this process on the opposite side creating your triangles again. 4. 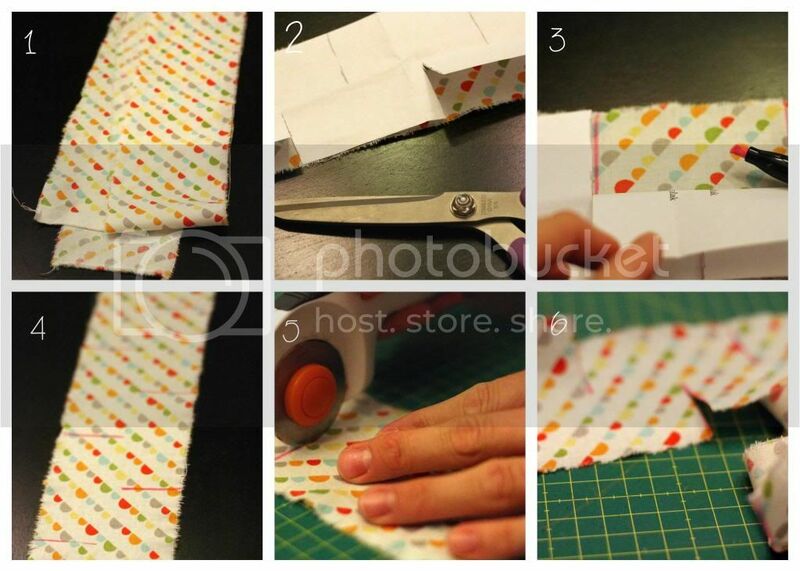 Continue folding down your triangles across the length of your fabric. 5. Example shown finished. 6. 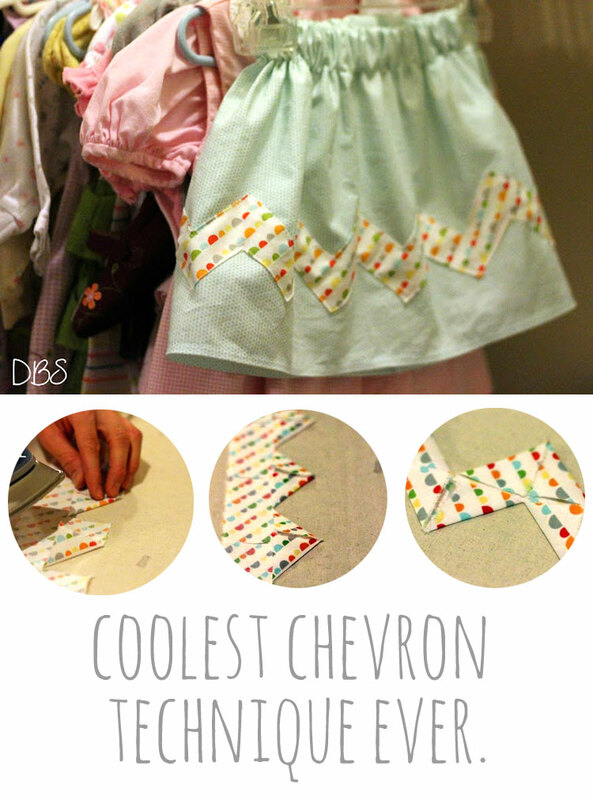 Flip your chevron over and iron down again. The biggest thing you want to be cautious about is that your triangle points are tucked under just right, so no fabric frays out the tips. Take your time and tuck and iron. Spray starch may be helpful here. Now you’re ready to sew this on your item, in my case a skirt! If making a skirt, you could go ahead and hem the bottom edge now, or you could wait until after you’ve sewn down your chevron, just make sure you leave enough seam allowance if you do it later. Pin down your chevron across the length of your fabric. 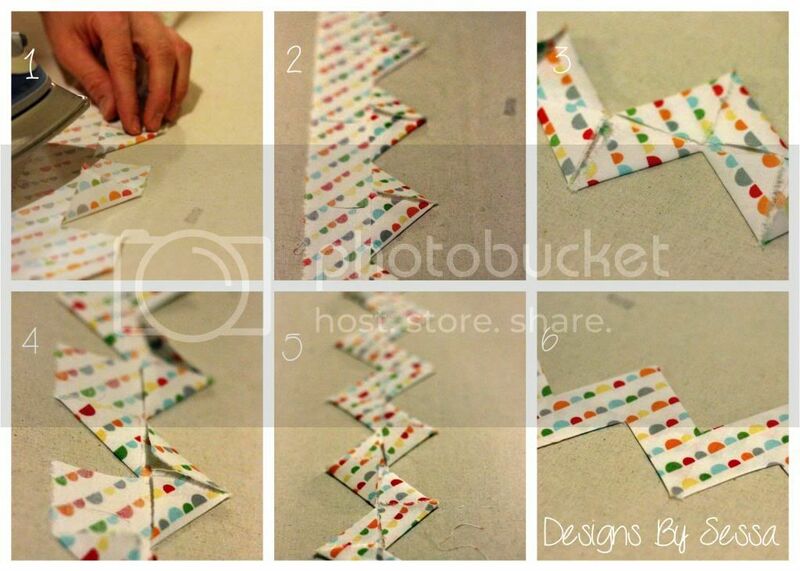 Make sure your chevron is the exact height from your bottom edge all the way across. 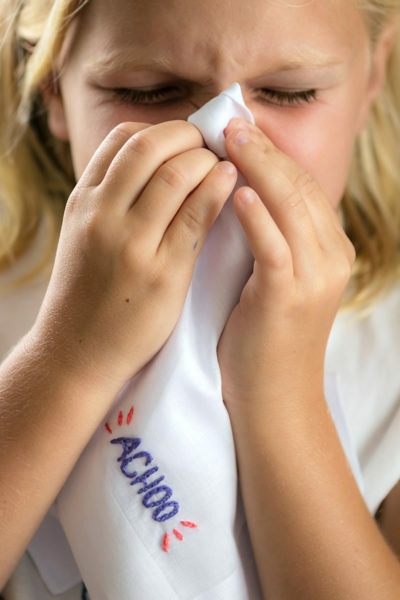 Mark your fabric if needed for placement. Now, edge stitch your chevron down, pivoting at the points and valleys. Repeat down the other side! And you’ve added your chevron applique! Hem the bottom edge at this point, if needed. Put right sides together along the two raw edges and align your chevrons to meet at the center. I had to move my chevron in a little to get it to line up perfectly. Pin to keep it lined up as you sew. 1. Sew/Serge/Zig Zag stitch down to join your seam. 2. Serge around the waist. You will need to decide the length of your skirt depending on your size to match your child’s height and length. If you don’t have a serger hem like normal by ironing 1/2” down. 3. 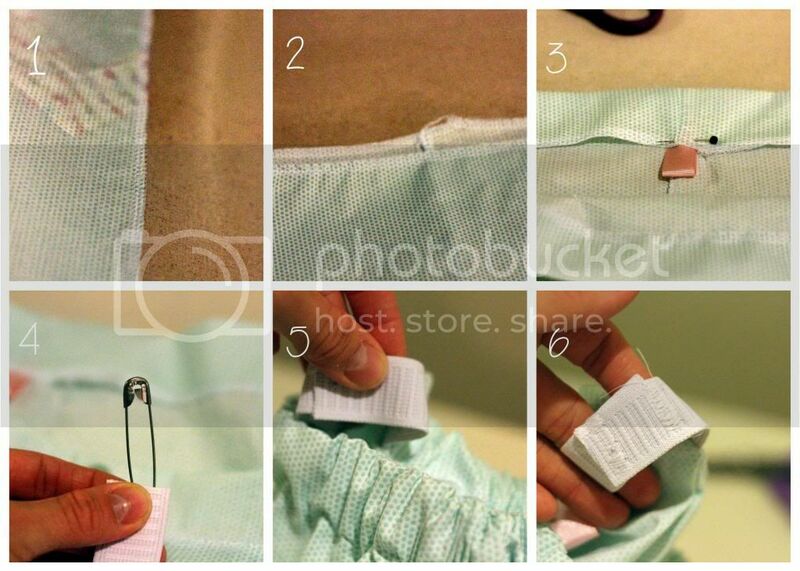 Fold over and iron 1” down again to make your casing and pin, or pin around 1” to create your waistband. 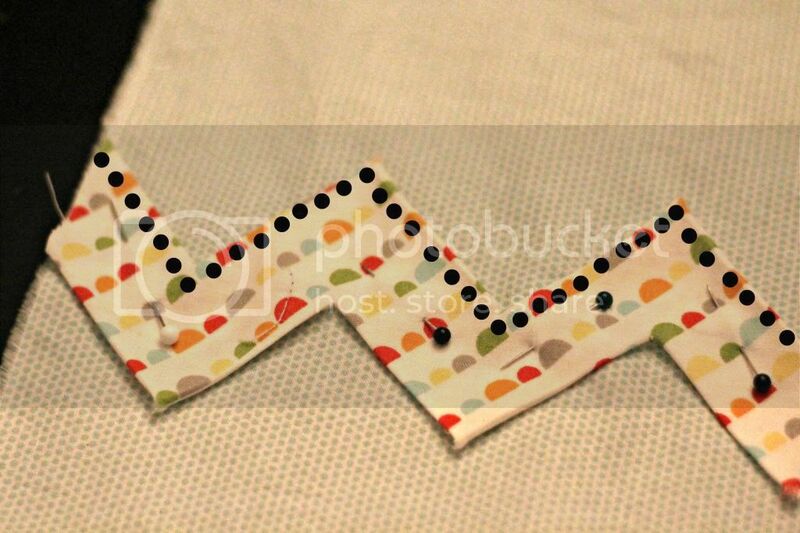 Add a ribbon as the tag, so your husband knows which way is back! (wink!) Sew and leave a 2 inch opening to thread elastic through. 4. Using a large safety pin, thread elastic through. 5. 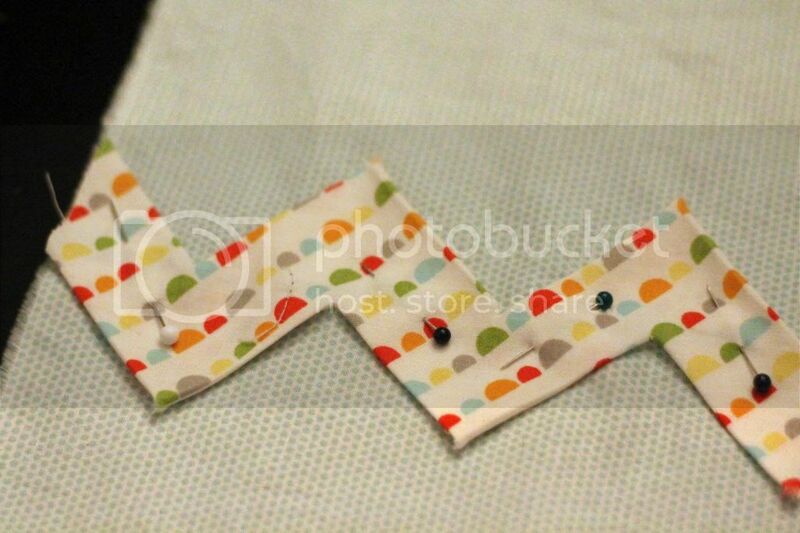 After pulling elastic through, lay it on itself and sew some zig zag stitches down the width of the elastic to secure. 6. Like so. 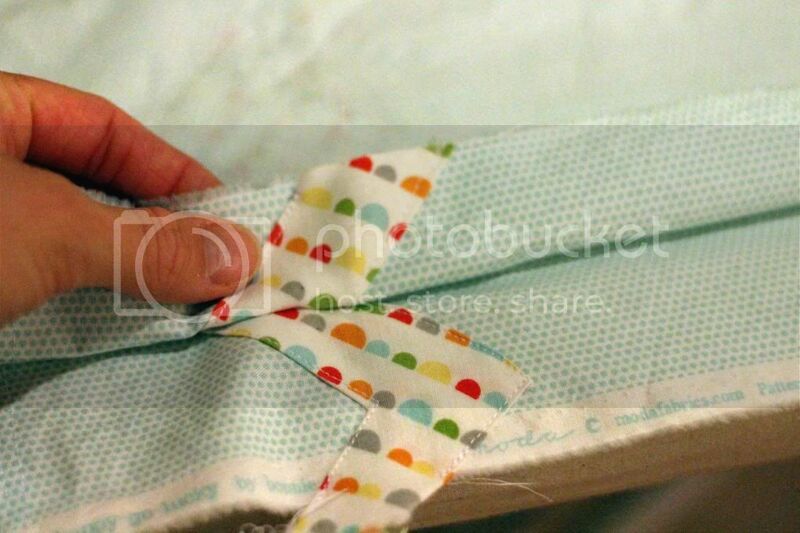 Tuck in, adjust your elastic and sew down the 2” opening! 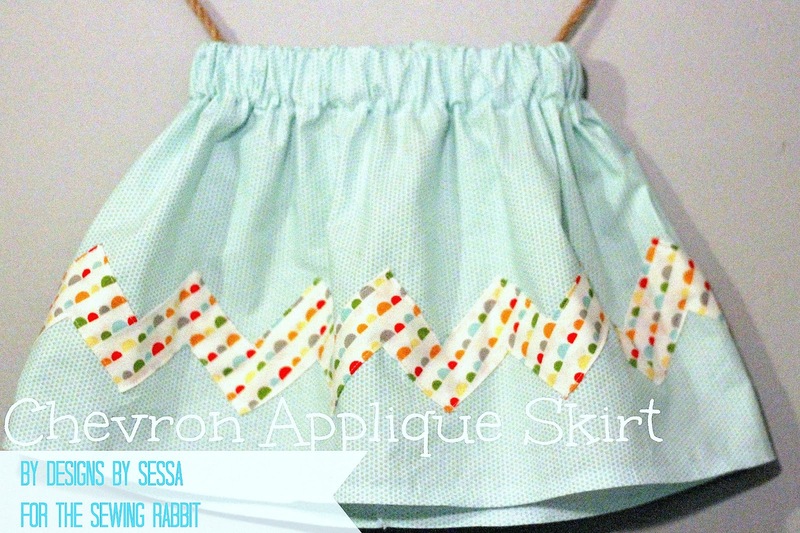 And you’ve got your cute chevron skirt! In fun fabrics! A huge thanks to Southern Fabric for sponsoring this post with the cute fabric shown in the skirt: Moda’s new line of Happy Go Lucky by Bonnie & Camille in Jump (Multi) and Penny (White Agua). I hope you enjoyed this tutorial! Please add your designs to the DBS Flickr group! I’d love to see what you come up with using this applique technique! My first time, I felt that way, but my second item I am working on totally went super fast with the ironing. I think you get it down! Also, spray starch really helped the 2nd time keeping all the triangles down, so I highly recommend that! Haha! I know little boys are awesome, too! Thanks! Oh man!!! Pinning this now, this just blew my mind too! Awesome, great find. Thanks for sharing!! Yay! Glad you love it! It really is fun and easy! The second item I made, I had it down and it took hardly anytime at all! Go for it, girlfriend! Let us know! Wow. Blew my mind. Pinning this! I am dieing over this. 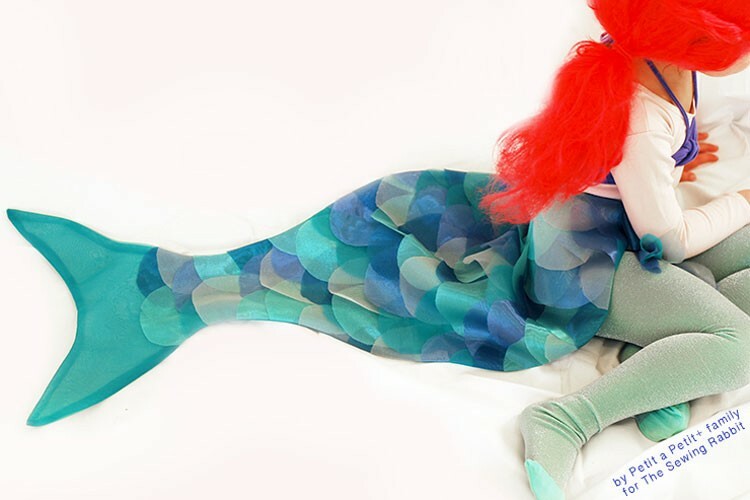 I just got a car load of fabric and have the perfect pieces to do this with. Thanks so much for the tut. Very cool, Vanessa! Love seeing your stuff over here! Congratulations on becoming a foster mummy. We’ve been foster parents for about 6 years now and it has totally changed our lives. Good luck with it all. The chevron is brilliant to btw. Thank you! I’m looking forward to getting our first placement! I know it will change ours, too! Yay! Glad you like it! Thanks for the comment! Can’t wait to try this. It’s so cute. But I can’t get the template to come through. Can you send it to me in an email attachment? Thank you.